TEN THOUSAND SPECTATORS TO SEE HIM DIE — THE HISTORY OF HIS CRIME. Nashville, Tenn., Sept. 26. 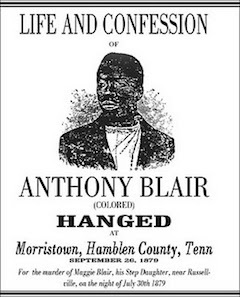 — A Morristown (Tenn.) special to the Banner says: “Your reporter to-day witnessed the execution of Anthony Blair, colored, for the murder of his step-daughter, Maggie Blair, a girl of 16 years, on the 30th of July last. The crime for which he suffered death was looked upon in this community as a most atrocious murder; there was no seeming cause or provocation, no excuse for it. This execution is pronounced by all as just. Blair was perhaps 30 years of age, an African in every lineament, brutal and sensuous in appearance, and looked to be capable of any crime. At 12 o’clock, Sheriff Loop, with 28 guards, went to the jail, and with your reporter entered Blair’s cell. Blair seemed callous, and without feeling. He submitted quietly to the manacles, and walked with a firm step to the wagon on which he rode to the gallows. After religious service by the Rev. 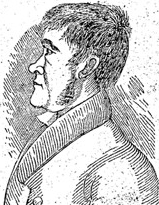 George Blainer, colored, the prisoner was allowed to talk. His harangue was such as would be expected from such a man. He admitted his guilt, but developed a state of facts leading to the crime which are unfit for publication. At 1:30 the rope was tied, the black cap arranged, and, at 1:35, the wagon moved from under him. In nine minutes no pulse could be distinguished; in 10 minutes his heart had ceased to act; in 15 minutes he was pronounced dead, and in just 22 minutes after he swung off he was lowered into his coffin. 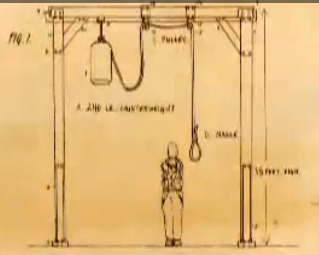 This was the first hanging in Hamblen County, and the crowd present was estimated to number 8,000 to 10,000. Blair lived in Washington County, near Jonesboro. From some cause Maggie had left his house, and came to this county some time in May last, and when killed was in the service of Esquire William Donaldson, and was represented as a very smart, industrious girl. Blair, hearing of her whereabouts, came down to Russelville July 29, and immediately made his way to the residence of Esquire Donaldson. He entered the kitchen where the girl and Mrs. Donaldson were engaged in preparing dinner. He asked the girl, looking savagely at her, to come outside the house, that he had something to say to her. The girl refused to go out, telling him that if he had anything to say, he should say it before Mrs. Donaldson. About this time Esquire Donaldson rode up, and Blair immediately left the house, and was seen no more until Wednesday, July 30. That night the girl, in company with others, went up to the colored church near Russelville to prayer-meeting. Returning, Blair was met in the road by parties who had been at the prayer-meeting. After some conversation Blair passed on to Russelville, but upon going a short distance, he turned back and took another road, which the young folks, including Maggie Blair, had taken. He overtook the party, and immediately walked up to Maggie, who was walking in the rear by the side of a colored by named Taylor. Pressing Taylor away, he caught her hand, and said: “You must go home with me on the train to-night to your grandpa,” and pulled her along the road 150 or 200 yards, saying she should go. Maggie struggled to get loose from Blair’s grasp, saying that she would rather die than go, whereupon he drew a pistol and shot her twice, from the effects of which she died the following Saturday. On this date in 1833, Antoine le Blanc was hanged on the Morristown (N.J.) village green. A cigar-chomping French immigrant, LeBlanc came to the New World to seek his fortune and found himself doing grueling farm work for Samuel and Sarah Sayre in exchange for a dank basement room but no pay. After just a couple of weeks in this unsatisfactory situation, LeBlanc clobbered Samuel Sayre with a spade … and then did the same to Sarah Sayre … and then killed their infant child. Stuffing all the portable valuables he could find into pillowcase sacks, he hopped on a horse and fled for New York, hoping to pawn his booty for passage back to Europe. Like an inept Scooby-Doo villain, LeBlanc in his haste managed to dribble a trail of the Sayres’ goods on the road, and these helped his pursuers corner him in the Meadowlands — an incriminating parcel of his ill-gotten gains right there beside him. The trial was a mere formality. The execution on an upward-jerking gallows drew an excited crowd several times the 2,500 souls residing in Morristown itself. And then, it really gets creepy. LeBlanc was condemned to post-execution medical anatomization, and the good doctors of Morristown took that as license for every posthumous indignity in the 19th century book. First, the late LeBlanc got a course of electrical shocks — a popular corpse experiment of the day whose object was discovering a means of reanimation but whose consequence was merely a ghoulish danse macabre of senseless, jerking limbs as each jolt charged the putrefying flesh. 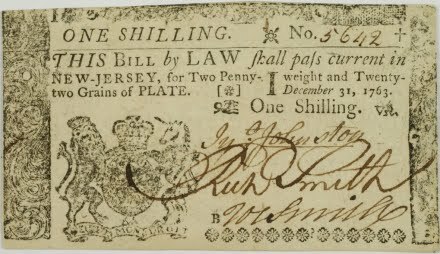 When they’d had their fill of zombie Antoine LeBlanc, they skinned the murderer and sent his hide off to be made into wallets and book covers which then got hawked to Morristown’s finest citizens. That sounds like an urban legend, but scroll down this page for the pictures: some of these objects have made it to museums, but it’s thought that others persist in private collections, handed down over the generations or just stashed away forgotten until they can emerge for a starring role on Antiques Roadshow. Apparently the old Sayre house (significantly rebuilt after a 1957 fire) still stands in Morristown … and it’s haunted by LeBlanc and his last victim, the baby Phoebe.